Aloo Methi is a side dish served with rice , such side dishes are called sabzis in India. Aloo is a cuisine popular among North Indians from the places of Punjab, UP, Bihar and Delhi. It is a dry curry and taste is simple and is good for health. Green vegetables are considered good for people belonging to every age. 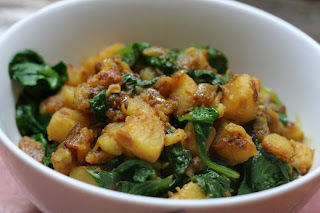 But green vegetables are considered boring, but with dishes like Aloo Methi, they can be made wonderful. This cuisine looks simple and it is even more simple and esy to cook. It can be served with rice as a side dish or even served with Chapathis. Wash the fenugreek leaves thoroughly several times and chop them fine. Sprinkle some salt over them and keep aside for about half an hour.Sprinkling salt water removes a sour taste which fenugreek leaves have. This step of sprinkling salt water can also be avoided . Heat oil and add crushed garlic and fry till brown. Add cumin seeds , asafoetida, dry red chilies, chopped onions and silted green chillies. Saute them till onions turn golden brown. When cumin seeds crackle and onions and chillies are brown, add turmeric powder, chilli powder and tomatoes. Saute them till tomotes are tender soft. Now add the potatoes and saute them. Add salt and saute them for a minute. Sprinkle some water and close the lid and cook on medium flame till the tomatoes are half done. Even potatoes can be pre-boiled and chopped into cubes. In that case, just add the potatoes and stir for a minute, dont cook for long time . When pototoes are half cooked and the spices gets coated over them, add the methi leaves and cook them on medium flame for 5 minutes or till water is fully absorbed. ( If you are cooking on low flame , cook for 15 minutes). And see to it that all the water is evaporated. This indictes that the methi is well cooked. Finally add 2-3 pinches of garam masala to it and stir for a minute. Aloo methi is ready to serve. Serve them hot with steamed rice or chapathis. Serving suggestion: Serve hot with steamed plain rice or Chapatis. This curry is served dry. But those who prefer it as gravy can add 1 glass of water at the end and cook for few minutes. This dish doesnt require any garnishing. But still those who prefer garnish can add few chopped tomatoes pieces on the top and serve it hot. Often people avoid green vegetables. And green vegetables are considered boring and tasteless. But there are few cuisines which are not boring and tastes delicious. Palak Paneer is one such splendid cuisine, which not only looks delightful but also tastes awesome. Palak is the Indian Hindi word for Spinach and Paneer is the Indian version of Cottage Cheese. In most of the foods, be it fast food, or western version , Spinach and Paneer when combined makes the food look beautiful and creates a yummy taste. Palak Paneer is a food fromNorthen states of India like Punjab, UP, Kashmiri and Delhi. And is served with Jeera rice or plain rice. This cuisine is made using main ingredients Spinach, paneer and few spices. It is easy to prepare and can be seen in the menu of special ocassions. Paneer is easily available in stores anywhere be it India or other countries, if not then it can also be prepared at home. I will include a post on making paneer at home. But when you are short of time, buying readymade paneer from store is best option. The creamy texture of spinach with paneer is a very good combination. Whole Wheat flour - 2 tablespoons (optional- only if you find the spinach gravy or cream very thin in consistency). Mix green chilli paste and ginger-garlic paste with spinach. Add little water (if you are using spinach leaves). Pressure-cook the above mixture for 7 to 8 minutes. Remove before the first whistle. Cut cheese into small cube shaped pieces. Keep 3 cubes for decoration. Blend the tomatoes to make puree. Mix coriander, turmeric, garam masala, black pepper powder and red chili with tomato puree and set aside. Mix whole-wheat flour with heavy cream and set aside. ( This step is necessary only if you find the spinach puree and cream to be thin in consistency) . Normally green vegetable retains some water to it, so does dairy product. As a result, while cooking they tend to leave more moisture or water , hence adding wheat flour will help it thicken. Cube the paneer in about half inch pieces and deep fry them on medium high heat just for few minutes so paneer become very light gold in color, take paneer out on paper towel so extra oil can be absorbed. Heat the oil in a saucepan. Add the butter to it and onions to it. Saute till it turns pink. Add hing and cumin seed. After cumin seeds crack, add the tomato puree mixture, and let it cook for a few minutes until the tomato puree is about half in volume. Add the spinach, and let it cook on low medium heat for about 10 minutes covered. Add heavy cream mixture and let this cook another four to five minutes. Add paneer and fold it gently with spinach and let it simmer for a 2-3 minutes. Keep the pan or tawa or whichever utensil you are using for cooking palak paneer , closed with a lid or plate to avoid the spinach to splatter and thus leaving you with boils or any mishap. Or to , you can also bake it on oven over 180 degree C for 30 minutes. Transfer the spinach to a serving dish and spread the tomato slices over the top, and cover the dish so tomato slices get tender with the steam from the spinach. Serving suggestions : Serve hot with steamed hot rice or jeera rice. You can replace the heavy cream with 1 1/2 cups of milk. Normally green vegetable retains some water to it, so does dairy product. As a result, while cooking they tend to leave more moisture or water , hence adding wheat flour will help it thicken. Cream is added to make the taste of Palak paneer intresting and taste. Since most of them dont like the taste of green vegetables especially kids. Adding cream will enhance the taste and make it look delightful. Panner is a dairy product also known as Cottage Cheese. Kadai Paneer is a Punjabi and Delhi Delicacy and is very popular world wide. This cuisine can be found in the menu cards of every small and big restaurants in India and other parts of the world where Indian food is served. The word "Kadai" is a Hindi word which means a deel bottomed vessel with handles on both sides (see the utensil/vessel in the above pic for reference). Kadai Paneer is spicy side dish which is cooked using the main ingredient Paneer along with capsicum, tomatoes and few spices for taste. It is dish without much gravy but is not even a dry dish. Tomatoes are added to give it a tender fresh gravy like consistency which other spices are added without being grounded to keep the freshness of paneer intact. Kadai Paneer goes well with Pulao, Briyani, Jeera Rice and also Rotis and Naans. It is easy to cook where the Cottage cheese (paneer) is and bell peppers or capsicum is cooked with spicy tomatoes or its gravy. Freshly chopped Coriander leaves / Dry Kasuri methi - 2 tablespoons. Cut paneer and bell peppers into ½ inch cubes. Blend the tomatoes, ginger, and green chili to make a puree. ( Even Chopped Tomatoes can be used for this cooking). Heat the oil in frying pan on medium heat and stir fry paneer for about 2 minutes - take them out before paneer starts changing color. Next stir-fry bell pepper until they are tender. Do not over cook the bell pepper. Take them out and drain on a paper towel. Using the same frying pan, Test the oil by adding one cumin seed to the oil; if seed cracks right away oil is ready. Add the asafetida and cumin seeds. After the cumin seeds crack, add the cloves, cinammon, Bayleaves, dried red chillies and onion. Saute it till onion changes its colour to light brown. Add the tomato puree, coriander powder, turmeric, fenugreek leaves and cayenne pepper. Cook for about 4 minutes on medium heat. Tomato mixture will reduce to about half in volume. Add about 2 spoons of water, and the salt. Wait till gravy comes to boil add paneer and bell pepper and let it simmer for about five minutes on low medium heat. Stir gently after adding the paneer to the gravy. Now it is ready to serve. Garnish with coriander leaves or kasuri methi, toss and serve. Serving Suggestions: Serve hot with Jeera rice, Pulao or Briyani. It can also be served with Roti or Naan. Instead of frying the paneer, we can also put the paneer pieces in a cup of water and heat it in the microwave oven for 1:30 min. then drain the water and use the paneer immediately. Tomatoes can be chopped and used too instead of blended puree. Dont stir roughly or more after adding the Paneer. Those who are afraid or new to cooking , better use Non-stick kadai. Khoya mattar is a Punjabi cuisine which is high in calorie and delicious in taste. Khoa or khoya or khawa or mawa is a milk food, made of either dried whole milk or milk thickened by heating milk in an open iron pan.It is similar to , but lower in moisture and made from whole milk instead of whey. There are three types of khoya - batti, chickna, and daan-e-daar. Batti, meaning “rock,” has 50% moisture by weight and is the hardest of the three types; it can be grated like cheese. It can be aged for up to a year, during which it develops a unique aroma and a mouldy outer surface. Chickna (“slippery” or “squishy”) khoya has 80% moisture. For daan-e-daar, the milk is coagulated with an acid during the simmering and has moderate moisture content. Different Khoya is used for different preparation. Khoa is used as the base for a wide variety of Indian sweets. Khoa is normally white or pale yellow. Khoa prepared in the winter may be saved for use in the summer and may acquire a green tinge and grainier texture from a surface mould.Khoa is made by simmering milk in an iron karahi for several hours, over a medium fire. The gradual vaporization of its water content leaves coagulated solids in milk, which is khoa. Khoya is used in various types of sweets such as pedha penda in Gujarati), barfi(or burfi) and halwa. This cuisine is prepared using daanedar khoya and matter(peas) as main ingredients along with few spices for taste and falvour. It goes well with rotis and can be counted among unique dishes for serving guests. Heat up oil in a pan, mix in onion paste and stir fry till pink. Mix in ginger-garlic paste and saute. Mix in tomato puree, turmeric powder, red chilli powder and roast till the oil leaves the masala. Mix in boiled peas and stir. Mix in salt, roasted khoya and stir. Mix in coriander powder and stir to mix well. Sprinkle cut green chillies, roasted sesame seeds, crushed red chillies on the bread croutons and mix well. 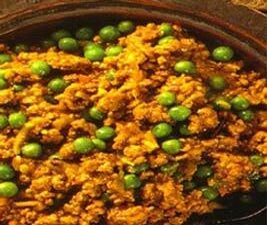 To serve assemble the khoya-peas masala in a dish and cover with bread crouton mixture. Serving suggestions: Serve hot with Rotis or Naan. Note: Use daan-e-daar khoya for this recipe. Daan-e-daar khoya looks like granules and is best for cooking this recipe. Dont roast the khoya for long or else, it might get sticky . Just roast slightly on medium or low flame for 2 minutes. Parathas are popular Indian breads from Punjab. A Paratha can be made simple and at the same time, it can be made delicious with stuffed ingredients too. Thus, various stuffed parathas are prepared like mooli paratha, gobi paratha, methi paratha, onion paratha etc. This stuffed parathas are made by stuffing the main ingredients namely, gobi, onion, mooli etc with some spices added to it. This gives a yummy taste to the bread and it hardly needs any side dish to be served along. In Punjab, Usually such Parathas are served with Dahi and pickles. And it really goes well with them, it tastes delicious and makes one want more for it. In the earlier post, I have posted Mooli Paratha, this time its Gobi Paratha. Gobi Paratha is easily to prepare and doesnt need much preparation besides grating of gobi. This is how a stuffed Gobi Paratha looks like before it is rolled out . Be sure to cover the stuff inside the dough. Mix together salt and flour and rub in two tablespoons of ghee, then add enough water to make a stiff dough. Keep covered for fifteen to twenty minutes. Clean, wash and finely chop coriander leaves and mint leaves. Remove stems, wash and crush green chillies. Peel, wash and grate ginger. Mix these ingredients together adding amchur, salt to taste and red chilli powder. Divide dough in lemon-sized balls, roll out each ball into a medium thick chapati using flour for dusting. Spread the cauliflower mixture on half of one chapati and cover with the other half and seal the edges. 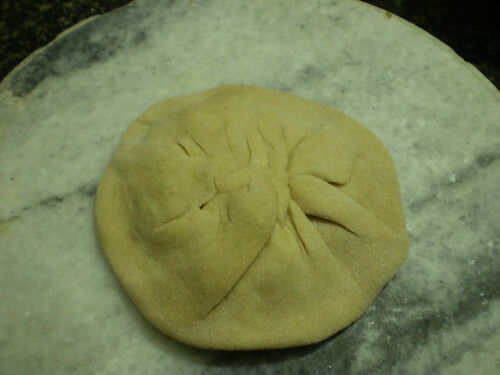 Sprinkle a little flour on top, and roll the semi-circle a little taking care not to break it. Alternatively, pat with fingers. Heat a tawa and cook the parantha on both sides. Shallow fry to golden brown using a little ghee. Serve hot with butter and a bowl of raita or dahi and pickle. Shelflife: Best fresh and stays upto 1 day. Serving suggestions: Raita, dahi or pickle. Some people do add garam masala to tha stuffing, I havent added it since garam masala doesnt give a distinct taste to the paratha. Amchur on the other hand, doesnt let the taste of cauliflour out of the paratha , thus making it unique. 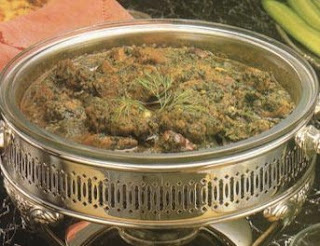 Sag Gosht is a popular Indian cuisine which is now popular not only in India but all among the middle-east countries. This Sag Gosht is a recipe from Punjab and the word sag is a punjabi word which means spinach. This is a greeny cuisine and is healthy and delicious at the same time. Sag can be found in the menu of top restaurants. It is served with Roti or Naan. It can be prepared easily at home as it requires less ingredients. This Sag Gosht can be cooked in Oven too. Hence, just read this and try it . It is worth on your dining table, and all of you would love it. Rai or Mustard Seeds - 1.5 tbs. Salt - 1.5 teaspoon ( vary it as per taste). Take a heavy bottomed pan and put on heat. Add oil or ghee and add the mustard seeds and fry until the seeds begin to pop. Add the lamb cubes and fry for 5 minutes. Add some salt ( to help cook the lamb) and stir. Cook the lamb for few more minutes until evenly browned. ( Remember you don't have to cook it completely). Now add the onions and stir. Keep on stirring until the onions are golden brown. Add the finely chopped spinach and stir well. Add the Cardamom Powder and stir. Add the Coriander Powder and stir. Take the pan off the heat and add the dahi or Yoghurt and stir and put it back on heat again. Add the Amchoor Powder and stir( Amchoor is used to give a slightly tangy taste), if you wish you can avoid it or use fresh lime juice while serving. Now put this mixture in a pressure cooker and cook for 20 minutes. ( If you do not have a pressure cooker then keep on cooking in the same pan for about 45 - 60 minutes with lid and on slow heat ). If you prefer to cook in Oven then you can transfer this mixture to an Oven Dish and cook in a preheated oven at 150C ( Gas Mark 2 , 300F) for 20 minutes. Serving Suggestions: Serve Hot with Roti, Naan or Paratha. If you wish to make a smooth paste of the spinach then you can take out the meat cubes from it and use a hand blender in the pan to blend it . Then add the meat peaces back in. You can sprinkle some lime juice on top if you wish. Or Add some butter on top. Chicken Jalfarezi is a cuisine you can find in the menu of top Indian resturants. It is a recipe from Punjab and is known for its hot and spicy taste. I suggest to prepare this during the season when fresh peppers are easily available. This chicken cuisine is prepared with fresh green peppers, tomatoes and few very few indian herbs. It can be served with any indian bread or with rice. It got its name Jalfarezi due to the use of peppers. I recommend to use all the peppers like Red peppers, green peppers and yellow peppers as this enhances the taste and look of the cuisine. Remember to pick mildly hot peppers , it will add spiciness to cuisine. Jalfarezi or jal farezi means dry fry and this delicious hot dish does not have much gravy. Instead the thick sauce tantilising clings to spicy chunks of chicken and pepper. Salt & black pepper to taste . 1 tbsp chopped coriander leaves . Slice the chicken breasts into bite size pieces and put them in a bowl, add the marinade ingredients and mix to make sure the chicken is well coated. Set aside for an hour or overnight for the flavours to penetrate the chicken. Heat the oil in a large heavy pan, when it is very hot add the onions and peppers and fry stirring over a high heat until the vegetables are cooked and starting to blacken at the edges 10mins. Add the curry leaves and marinaded chicken and stir fry until the chicken becomes opaque then add the chopped tomato and cook for a few more minutes until the tomato is soft and the chicken is just cooked through. Stir in the coriander and fresh chilli slices, serve with Chapathis or any indian breads or rice. Cooking Time: 20 -25 minutes. Serving Sugesstions: Serve hot with any Indian bread like Roti, Naan or Paratha . It can be served with rice too. Most of the cooking in this dish is done before the chicken and tomatoes are added, the chicken should only just be cooked through and the tomatoes soft but still fresh tasting. Dont overcook the chicken and make it hard and rubbery. Just cook till it is soft and tender. 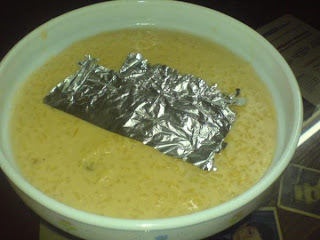 Sugarcane Kheer is a speciality among Punjabis. The land of punjab cultivates lots of Sugarcanes and Punjabis are fond of eating them and drinking its juice. This particular Kheer called as Sugarcane juice is prepared by Punjabis during the festival of lohri which is a harvesting festival. Lohri is a festival as old as the Indus valley civilasation . Harvesting festivals are celebrated all over india during the same time like Pongal in Tamil Nadu, Makar sankranti in West Bengal and Maharashtra, Tai pongal in Kerala, Magha Bihu in Assam. All this festivals are celebrated on the auspicious day of Makar Sankranti. There are some legends and tales related to Lohri. According to the history of Punjab, Bhatti, a rajput tribe during the reign of Akbar inhabitated the regions of Punjab, Rajasthan and Gujrat( now in Pakistan) . Dulla Bhatti, a raja of Pindi Bhattian was put to death for revolting against Mughal ruler. Street singers claim Maharaja Ranjot Singh as one of its scion. Dulla Bhatti likeRobinhoond, robbed the rich and gave it to poor. He once rescued a girl from kidnappers and adopted her as his daughter. The people used to love and respect him a lot. During Lohri, group of childrens ring doorbells and sing songs of Dulla Bhatti (A folk song) " Dulla bhatti ho! Dulle ne dhi viyahi ho! Ser shakar pai ho!". Lohri is a festival dedicated to fire god and Sun god. In astrological terms, it is form Uttarayan where sun changes it position and brings warmth to earth. During Lohri people dance around bonfire and celebrate it. Thats all about Lohri festival. Now am posting the sugarcane kheer recipe. Do read and enjoy it. Its a simple , tasty and healthy kheer. Basmati Rice - 100 grams. Wash the rice and add it to the sugarcane juice. You can also soak the basmati rice for some 10 minutes before adding to the juice. Cook the contents on low flame. Since sugarcane juice tends to create foam when being cooked. Cook the mixture till the sugarcane juice and rice turns soft. Remove from fire when it becomes thick in consistency. Serving suggestions: Refrigerate in fridge and serve cool. Note: Always use fresh Sugarcane juice for this kheer. And use Basmati rice and it blends nicely with this juice. Chicken Dilruba is a side dish from Punjab. It is rich in taste and tasty which makes one long for it. It is usually served with parathas or rotis. It is rich food since it is cooked by using butter, almonds , walnuts , milk, kesar etc. The preparation time for this cuisine is time consuming but the result is worthy . Here in this recipe, melon seeds or pumpkin seeds are used which makes a thick gravy. Just read and try this cuisine, I bet you would like it. Melon, pumpkin or squash seeds cashew/almonds - 1/4 cup, grounded for garnish (optional). Put the onions and ginger in a blender and grind to a smooth paste to the consistency of sauce. Heat oil or butter in a heavy and deep bottomed tawa. Add the onion-ginger mixture to it and saute it till brown. Keep stirring often as this paste gets burned quickly or sticks to the bottom of vessel. Add the chicken and yoghurt . Combine and cook over medium heat till the mixture becomes dry and chicken begins to brown. Grind the almods/ cashew, melon and walnuts to fine powder. Stir them in the milk and add it to the mixture of chicken along with garam masala, red chilli powder, green chilli mince, turmeric and salt. Cook over medium heat , stirring often till the chicken is tender and the sauce is thick. This takes some 15 minutes. Stir the saffron soaked in milk mixture and pour it to the chicken mixture. Close the lid and allow it to cook for 2 mins more. Serve hot with Roti, Naan or Parathas. Serving suggestions: Serve hot with Roti, Naan or Parathas. Melon seeds, pumpkin and almonds seeds are optional for garish and to add rich taste to the cuisine. Calorie consious people can avoid it. Even any one of it can also be used in limited quantity. Keep stirring often as thick gravy tends to stick to bottom of vessel in most cases. Click here to know more about Punjabi foods and cuisines - An Introduction To Punjabi Foods And Cuisines . Butter chicken , a famous indian cuisine from punjab is widely liked by people all over the world. It is always found on the menu book in restaurants which have traditional indian foods. Butter Chicken has another too namely "Murgh Makhani". It gets its name Butter chicken due to its silky texture and pleasant appearnce which reminds one of butter and also butter is used while making this cuisine. A good Butter chicken should have a tasty gravy, and this gravy is called Makhani. Makhan is the hindi word for butter hence, it has its name Makhani. I am tried this Butter chicken many times and everyone loved it. By the passage of time, i have learnt few tricks to cook a delicious Butter chicken, and i am glad to share this through blog. For a good Butter chicken, follow three steps of preparation seasoning of chicken, marinade and preparation of makhani gravy. A good Makhani should taste little sweet so i preferred adding honey and cream too. Read and enjoy the delicious Butter chicken at your home. Make incisions (small cuts) with sharp knife on breast and leg pieces of the chicken. Apply a mixure of red chilli powder, lemon juice and salt to the chicken and set aside for half an hour. Hang yoghurt in a muslin cloth for fifteen to twenty mintues to remove extra water. Add red chilli powder, salt, ginger-garlic paste, lemon juice, garam masala powder and musturd oil. Put the chicken on to a skewer and cook over moderaly hot tandoor or a pre-heated oven (200 degree C) for ten to twelve minutes or till it is alomost done. Baste it with some butter and cook again for another 2 minutes. Heat butter in a pan. Add green cardamoms, cloves, peppercorns and cinnamon. Saute for 2 minutes, add ginger-garlic paste and chopped green chillies. Cook for 2 - 3 minutes. Add red chilli powder, garam masala powder, salt and one cup of water .Bring it to a boil. Reduce heat and simmer for another 10 minutes. Add sugar, honey and powdered methi leaves. Add cooked tandori chicken pieces. Simmer for 5 minutes. Then add fresh cream to it. Serving Suggestions: Serve hot with Naan or Paratha. Heat kasuri methi in the oven for sometime or broil kasuri methi on a tawa or griddle plate to make it crisp. This way, it can be easily crushed with hands. After adding chicken, dont cook on high flame. And also dont stir continuously. Always use fresh lemon juice for marinades. To check whether chicken is done while in oven or tandoor, just pierce a needle or skewer to it. If case it is cooked then it would go inside easily and while it is removed, you wont find chicken sticking to it. After adding cream , dont cook over flame for more than 1 min . Click here to know more about Punjabi foods and cuisines - An Introduction To Punjabi Cuisines And Recipes. Jeera rice is usually counted among briyani and pulao categories. Jeera rice is a punjabi cuisine and is simple yet tasty and delicious. It is served with some spicy curry like mutter panner or ghata etc. Rice lovers would definately love it and since it is a simple version of briyani, it goes wel with any side dish . It is also affordable and is very econimical to cook at home. Wash the rice and soak in water for half an hour. Heat gheee in a heavy saucepan. Add cashewnuts and fry them. Fry them until brown, then keep them aside. Now to the ghee add bayleaves, cloves, cinnamon, blackpepper and cumin seeds. Fry them for a while will cummin seeds crackle. Add the rice, salt and water and stir. Add water till it covers the rice or add water in proportion of 1:2. (2 portions of water and 1 portion of rice). Cover the lid and simmer the flame. Serve Jeera rie with any spicy indian curry . Serving Suggestions: Serve hot with any spicy indian curry. It tastes excellent with mtter paneer and shahi paneer. Dont soak the rice for more than 30 mins. Dont keep stirring continuously when it is being cooked. Keep the lid closed so that the aroma remains.